Get organic grass fed beef delivered to your door in Orange County, CA! Why is organic grass fed beef so important to your healthy lifestyle? The cattle are raised in the Pacific Northwest where there is abundant green grasses for our organic cattle to roam freely and eat the diet they were made to eat – 100% organic grasses! This in turn allows the cattle to live a healthier more active life than those raised in feedlots which means they are never given antibiotics, growth promotants or steroids. Their meat is also much higher in heart healthy Omega3s and CLAs and lower in fat and calories. If you are practicing the Paleo diet lifestyle, you may already be familiar with these and other benefits of organic grass fed beef. 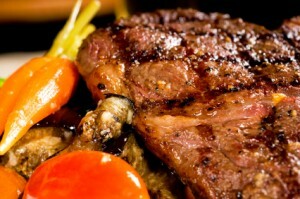 Why organic grass fed beef for the Paleo Diet? The Paleo diet is a return to the natural human diet when we were hunter-gatherers. As hunters, we never hunted animals in feedlots that were fed a manufactured grain diet. So, to source organic grass fed meats is an integral part of this lifestyle. Because some of us don’t have the time or inclination to drive all over town looking for farmer’s or organic markets, or we don’t have the room to store 1/2 a cow, Topline Foods offers simple online ordering of only the precise cuts of organic grass fed beef – and more – that you prefer. No wasted time or gas, place your order online and we deliver to your door! Nature’s finest meats, delivered! This entry was written by Jeff, posted on January 23, 2013 at 9:20 pm, filed under Announcements - Cities and tagged home delivery of organic beef in Orange County, mail order delivery grass fed organic beef Orange County, Orange County grass fed beef, organic beef Orange County, organic grass fed beef in Orange County, organic grass fed meat Orange County, Where can I buy organic grass fed beef in Orange County, Where can I find organic grass fed meat in Orange County. Bookmark the permalink. Follow any comments here with the RSS feed for this post. Both comments and trackbacks are currently closed.